Fortaleza do Monte (Portuguese for Mount Fortress, also Monte Forte, officially Fortaleza de Nossa Senhora do Monte de São Paulo, in English: Fortress of Our Lady of the Mount of St. Paul) is the historical military centre of the former Portuguese colony of Macau, in the People's Republic of China. It is part of the "Historic Centre of Macau", a UNESCO World Heritage Site. 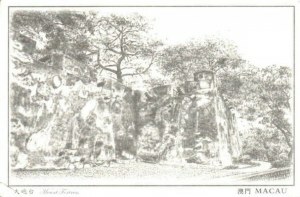 The fort was initially built in 1617-1626 by to protect the properties of the Jesuits in Macau. Later it was seized by the Governor for the defense of Macau.